AKRON, Ohio, November 23, 2016 - The Goodyear Tyre & Rubber Company's Eagle-360 concept tyre has been named one of Time magazine's "Best Inventions of the Year 2016." Each year, Timemagazine's technology editors list the year's "best inventions that are making the world better, smarter and-in some cases-a little more fun." This year's list includes 25 inventions, which in addition to Goodyear's Eagle-360 concept, includes a virtual reality headset, shoes that lace themselves, a solar roof collaboration between Tesla and SolarCity, and the Chevy Bolt electric vehicle. "By steadily reducing the driver interaction and intervention in self-driving vehicles, tyres will play an even more important role as the primary link to the road," said Goodyear's Chief Technical Officer Joe Zekoski. "Goodyear's concept tyres play a dual role in that future both as creative platforms to push the boundaries of conventional thinking and testbeds for next-generation technologies." 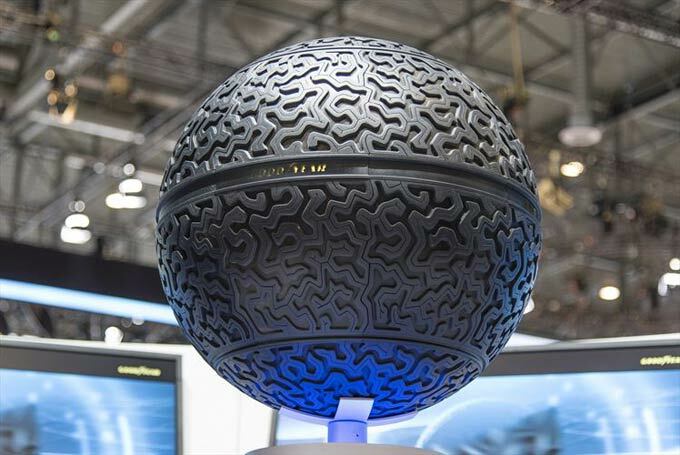 The Goodyear Eagle-360 is a spherical-shaped design concept tyre that would provide self-driving cars ultimate maneuverability, connectivity and biomimicry to increase safety. An in-depth description of the concept's technology can be viewed online at https://www.youtube.com/watch?v=oSFYwDDVgac. "Although the Eagle-360 is a future concept, it represents an essential aspect of Goodyear's innovation strategy and our vision for smart and safe mobility." A full list of the 2016 Time magazine "Best Inventions of the Year 2016" is available online at http://time.com/4572079/best-inventions-2016/.